The first Monday of each month, I dust off a favorite post from the Bennis Inc Blog archives and give you another chance to enjoy the wit and wisdom that’s been shared. Enjoy this month’s treasure – and if it inspires you – be sure to share it with family and friends! In an ideal world, we would all become best friends with our clients and enjoy the work we do for them so much that we would wonder why we’re actually being paid. But in reality, some clients push us to the point of resolving that no amount of cash is enough to offset the stress and anxiety they add to our lives. If you’re forced to make the tough decision of whether or not to cut ties with a client, it’s important to do so with professionalism and class. Even a strained client relationship has the potential to yield future leads and recommendations if you make the effort to leave with a mutual understanding. Everyone has a rare moment or two when a payment gets lost in the shuffle or maybe a particularly hectic month that causes you to make a late payment. But for this type of client, it happens all the time! It’s like they pay no attention nor do they care about your payment policy (i.e. net 30 days), yet they still want all their services delivered on time. Words of wisdom: After poking and prodding this type of client with reminders about making their payment, you might finally receive a check (sometimes with a nice “forgive me” note) and be tempted to continue the cycle with just “one more chance.” Just keep in mind that this relationship will continue to add stress to your day and steal time from your other clients. If you do feel compelled to stick with them, suggest that they move to quarterly payments (so that you’re only hunting down checks every 3 months) or invest in a system where you can automatically charge their account – businesses do it all the time! In my personal experience, these clients have been among my smallest accounts, yet ate up more of my time than clients paying 10x as much! They are great at micromanaging and wearing you down with negotiations on your pricing and requests for “just one more thing.” While you always want to under-promise and over-deliver for your clients, this business model is simply not sustainable. Words of wisdom: The first red flag that you’re dealing with this type of client often occurs as early as contract negotiation. They may try to talk you down on price while refusing to take out any of the services you propose. Use your gut to decide whether to proceed with working with them, but keep in mind that the relationship cannot go on if you are constantly taking a loss each month on their billable hours versus the amount they are actually paying you. It’s not fair to you or to your other clients. In personal relationships, we are far less likely to accept verbal abuse; yet so often we allow this to go on for far too long in business relationships. This type of client is one that is directly or indirectly demeaning and negative towards you or your staff. They may yell and swear at you, threaten you, or ever so subtly and indirectly put down your work. Whether the verbal abuse is obvious or subliminal, you cannot stay in this relationship. Words of wisdom: The bottom line is no one ever deserves to be verbally abused and you must end a client relationship immediately if this occurs. I promise you, it never gets better. No amount of money is worth this stress. This type of client is toxic because they can really disrupt your work-life balance. They don’t respect your time by expecting you to meet tight deadlines, canceling meetings at the last minute, asking you to start a project and then changing directions or failing to get you the information you need to do your job. They also encroach on boundaries by expecting you to be available in the evenings and on the weekends and to be doing work for them during this time. Words of wisdom: There will come a time when important projects require you to work late into the evenings or on the weekends. However, this should not be the case for most of this client’s projects. If they insist that all of their work is propriety, where does that leave your other clients on your list? While you may be doing work for your clients, you are still your own boss and must maintain a sense of control over your time by letting go of clients who don’t respect these necessary boundaries. This client wants you to have the magic solution to fix all of the problems within their business even when this task goes far beyond your area of expertise. For example, the client is asking for a new website, but really this is merely a bandage on a gaping wound of mismanagement, a weak business model and an unhealthy company culture. Words of wisdom: No one has all the answers – or expects anyone else to. If your client looks to you to be their marketing director as well as their business partner, investor, therapist and cheerleader…don’t walk away, run! Unless they acknowledge a good understanding of these other problems and demonstrate their determination to fix them, this is a toxic relationship that will only bring you both down. 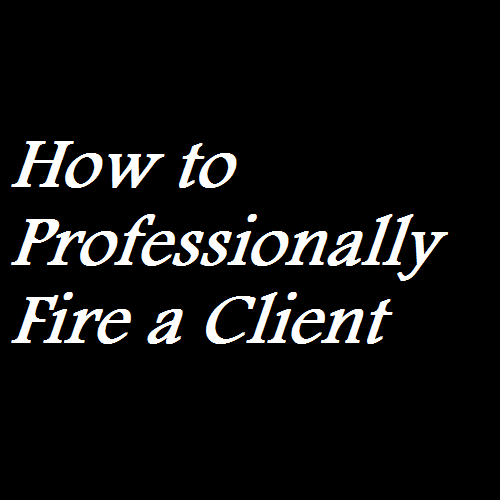 Have you ever had to make the tough decision to fire a client? What was the determining factor and how did you handle it? Share your experiences by commenting below!